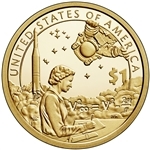 The 2019 Native American $1 Coin reverse design highlights the contributions of Native Americans to the U.S. Space Program. American Indians have been on the modern frontier of space flight since its infancy. American Indian contributions to the U.S. Space Program culminated in the three spacewalks of John Herrington (Chickasaw) on the International Space Station in 2002. These and other pioneering achievements date back to the work of Mary Golda Ross (Cherokee), one of the first female American Indian engineers. 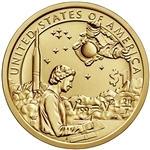 She helped develop the Agena spacecraft for the Gemini and Apollo Programs.